I've commented in the past on the value of moments frozen in time via photography, so it's fun when you stumble across an image that makes you sit back and stare in appreciation. I was looking for something entirely unrelated in Getty Images (How unrelated? 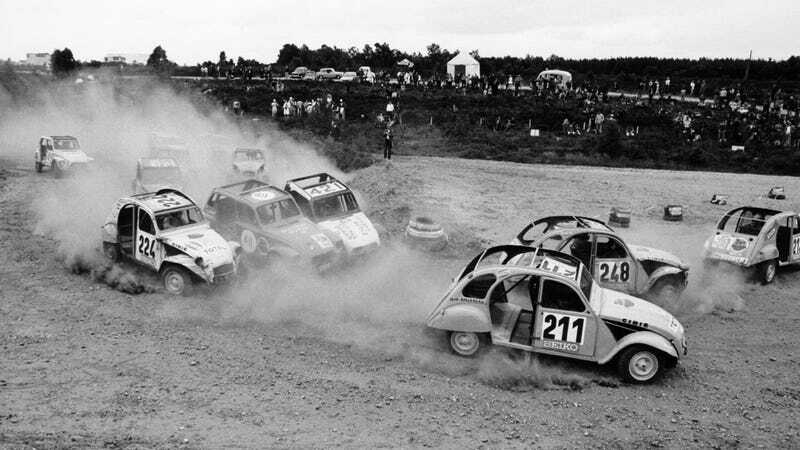 My search criteria included "NASCAR"), when the above Citroën 2CV rallycross shot materialized in the stream of results. The photo itself is undated, but I'd guess it's sometime in the '60s (note the fresh-looking Anglia parked in the background), and all I could think was, "Man, these guys are really going for it." It all looks absurdly fun. Who says you need big power to make some hay? 29 hp of caged fury!